Lewis Hamilton does not feel he was unfairly blocked by Nico Rosberg during the final session of qualifying for the Malaysian Grand Prix. Hamilton was on his second timed lap in Q3 and had set a new fastest first sector when he came across Rosberg on a slow lap. Rosberg appeared to make no effort to move out of the way for his team-mate and Hamilton backed off on the approach to Turn 7, putting an end to any hope of a quick lap. By the end of the session it made no difference as Hamilton's earlier time was enough for pole position, but the question of whether he was blocked was still put to him. "I did improve on my first sector, it was quickest, but then I just bailed out. I had traffic," he said. "I came up on quite a few cars ahead. The sector was looking quite good but the cars were going to get in the way so I decided to take a second lap." Asked directly if he felt he had been blocked, he added: "No. I decided to take the second lap." At the end of Hamilton's interview session, Rosberg, who had just entered the room ahead of his session with the press, took the opportunity to set the record straight after reading comments on social networks that he had indeed blocked his team-mate. Rosberg: "There's a lot of comments on Twitter saying Nico [I] blocked you. Is that true he [I] blocked you on your second timed lap?" Hamilton: "I think you should probably ask him. I think he'll have a good opinion on that." Cue laughter from the press. 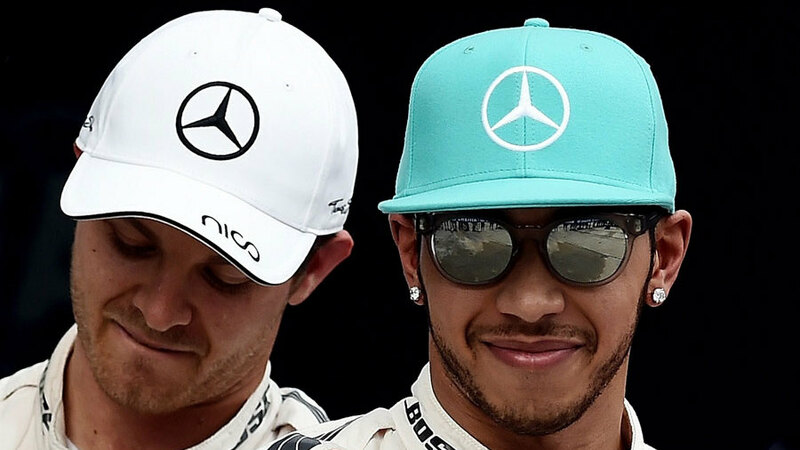 Rosberg, now slightly red-faced, was then asked if he blocked Hamilton and responded: "You best ask Lewis about that! No, it is not even a relevant discussion because we were both on slow down laps at that point in time. And that was very, very clear." When told that Hamilton had set a fastest first sector, he replied: "Yeah, but if you bail out of a lap it turns into a slow down lap, doesn't it? He backed off way before coming up on me." However, Rosberg was not satisfied with his initial answer and went to lengths to stress that he did not try to block Hamilton. "How do we make that a fact that he bailed out before he came across me? That is the interesting one because me just saying it isn't going to bear much weight. So, we need to think about that one, which I don't have an answer for right now. I don't have an answer for now, to make that a fact for you. But I will have to think about something later on. Or you can ask Toto [Wolff], that is maybe a good one. That will give some more weighting to it." Rosberg has history when it comes to hampering his team-mate's qualifying lap after running wide in Monaco last year, which prevented Hamilton from setting a quicker time. It seems the incident in Malaysia will not flare up in the same way ... for now.